New research shows that dark chocolate is beneficial because microbes in the digestive tract ferment both the antioxidants and the fibre in cocoa, which creates anti-inflammatory compounds that have been linked to improved vascular health. The health benefits are associated with raw cocoa, of which dark chocolate has a higher proportion than milk chocolate. When selecting a dark chocolate, opt for a higher percentage of cocoa for greater health benefits. For example, dark chocolate chips from the baking aisle are typically 50% cocoa, but good quality dark chocolate can be found in the chocolate aisle ranging from 50-90% cocoa. For this recipe, I recommend using a chocolate in the 70-80% cocoa range. Dark chocolate has a low melting point, so it is recommended to work with chocolate over very low temperatures. To melt chocolate, the easiest way to control the temperature is by melting it in a bain marie or double boiler. If you do not own this piece of equipment, you can easily create your own with a soup pot and a metal mixing bowl. Fill a soup pot with water one inch from the top. Turn the stove to low heat to let the water simmer. Place the metal mixing bowl on top of the pot, making sure that the bottom of the mixing bowl is submerged in water by at least one inch (make sure water does not get into the mixing bowl). Break up dark chocolate into smaller pieces and place inside the mixing bowl. Stir the chocolate constantly to prevent it from burning. 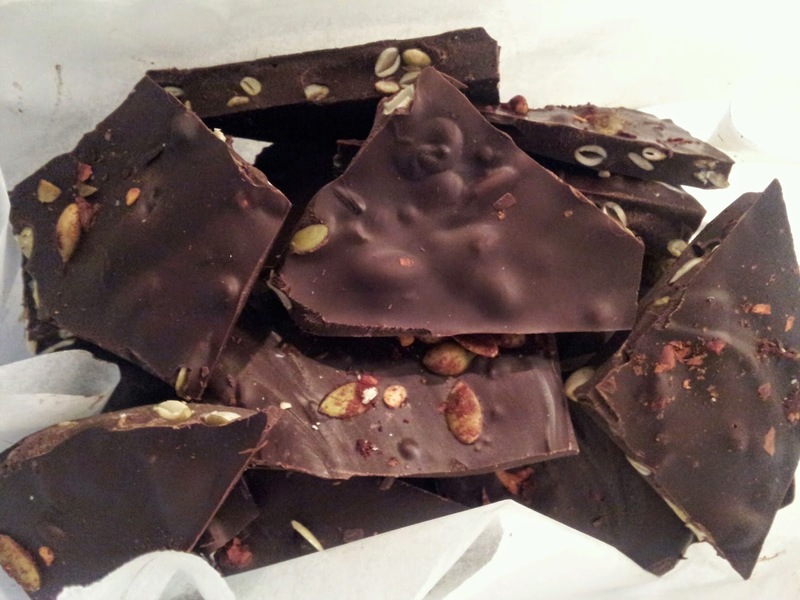 This recipe combines the Spiced Pumpkin Seeds and the benefits of dark chocolate! Line a baking sheet with waxed paper. Toast pumpkin seeds in a skillet over medium heat. Cook until fragrant, about 5 minutes. Combine with cinnamon, chili flakes, cayenne, and salt. Allow to cool. Add chocolate to bain marie over low heat. Melt, stirring frequently. Add toasted seeds and stir. Pour chocolate onto baking sheet and allow to set in refrigerator. Break chocolate into pieces before serving.